Re-Animator is an admirable horror comedy that succeeds because of its subtle construction in illustrating the tightrope dichotomy of its dual genres. An excellent example of this comes in the pre-credit sequence which shows an assortment of medical staff and police officers bearing witness to a much-admired faculty member screaming out in pain. As the scene goes on, director Stuart Gordon shows us the graphic nature of the Professor’s anguish with a combination of medium shots and close-ups, as his eyes start gushing blood, which lands in the face of his female assistance. After collapsing and seemingly dying upon impact, the lone man who was with the esteemed member of the University is accused of being responsible for his death. The man’s name is Herbert West (Jeffrey Combs), and he responds in a clinical matter of fact manner that he is the one who gave him life. Re-Animator is a film that is filled to the brim with these absurdist ironies that not only evident in the screenplay but also in the filmmaking. There are two moments in the picture that encapsulate this quality. The first is a minor instance in the hospital morgue as the main character Dan Cain (Bruce Abbot) wheels in a recently deceased patient and puts it in the corner of the room. As he does so, there is a dead body with burned arm that is blocking his way, and Cain puts it to one side as he continues with his job. However, the arm returns to his original state as if it is still alive. Gordon’s framing provides the scene with it’s amusing and sly quality as there are a few still bodies that are prominent in the background of the shot. As a result of this, the audience has an anticipation of a scene where all the deceased people start waking up. However, it only proves to be one in the silliest way possible. It is as though the body is purposefully playing a practical joke on Cain. In turn, Gordon is playing with audience expectation as the framing of the shots suggests the sheer horror of the concept, but ultimately result in a gentle acknowledgement of what is to come later in the picture. The second moment is when Cain greets his fiancee Megan Halsey (Barbara Crampton) with a passionate embrace and kiss in the hustle and bustle of their campus. She protests the gesture out of embarrassment with a half-hearted declaration of no three times. The scene then suddenly cuts to the couple making love with Halsey now saying yes three times. The moment is humorous because the quick cut is akin to the timing of a joke, which is underlined with the juxtaposition of both scenes. 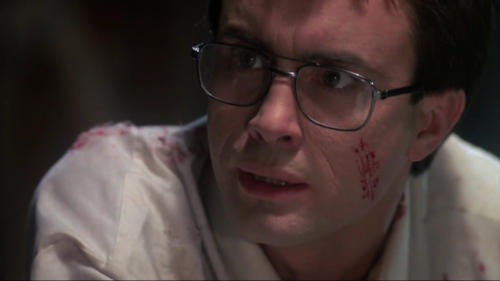 Nevertheless, the film’s pure comedic heart resides in an excellent central performance from Jeffery Combs as Herbert West. It is commendable how Combs takes the minute details of West from H.P. Lovecraft’s short story and injects a sense of dimension that results in the character feeling amusing and engaging. For example, in a passage from the first section of the short story, which is entitled “From the Dark” the narrator describes the character as someone who does not falter in the context of watching him waiting for a serum to display some effects in a experimented body. In the course of one scene, which depicts Cain coming face to face with the first of West’s experiments, Combs subverts this still and calm image of the character from Lovecraft’s story. Upon breaking into West’s basement, Cain witnesses West attempting to get a berserk cat of his back. In this moment, Combs effortlessly makes the potentially terrifying situation look funny with his physical comedy as he stumbles around the dimly lit environment. At the same time, Combs’s vocals are commanding and forthright in their purpose which shows his somewhat clear-headed state. Later in the scene, Combs balances slight empathy, an inner sense of malice intent and an unleashed madness as West places his hand on Cain’s shoulder and has a cautious and worrisome expression on his face. Soon after Cain throws the demonically animated cat against the wall and the camera lingers on West’s face as he conveys an expression of sly devilish glee as looks upon Cain’s action and his plans involving the young student. West’s blood stained clothes and defensive gesture of holding a mallet are accentuated by the lighting as the small ceiling lamp swings back and forth, which results in West being engulfed in shadow for mere seconds at a time. With this in mind, there is one shot where the character looks like a monstrous serial killer who is about spring upon his prey. Finally, West tells Cain to look out after the cat is dead, and the latter immediately turns around to fear to the amusement of former as he breaks into hysterics, in part a reaction to the situation and the madness within. Finally, in the context of the minuscule sub-genre of the horror comedy, Re-Animator bears the closest relation to James Whale’s 1935 eternally classic film- Bride of Frankenstein in the sense that it revels in the absurdity of its concept with many amusing extended scenes dedicated to its surreal premise. Like that film, it also shares a tragic quality. Herbert West’s experiments have caused the breakdown of a promising new relationship and have ultimately made Dan Cain just like him. Unfortunately, while this quality is conceptually apparent insofar as the sketch of the arc is evident to the viewer, the performance by the lead actor is terrible and in turn does not shade in the portrait of the character’s transformations. Bruce Abbot’s performance as Dan is a one-note exercise in blandness, as he has the same vacant expression throughout the entire picture. There is no sense of inner turmoil, temptation or excitement at what West is offering. It is a performance that would not even cut the mustard in a weekly episode of the Power Rangers.